Leaving behind Saint Lucia, we depart onto a last island-country in this cruise through the Caribbean before ending up at the starting point Barbados. Here we are in Grenada, docking at its capital city Saint George’s. First sighted by Christopher Columbus in 1498 during his third voyage to the Americas, and although claimed for the Crown of Spain, there was never found any evidence of settlement there. It was not until 1650 that the French settled and founded the capital at the eastern edge of the harbour named Saint Louis, however not a good location due to flooding and malaria, hence a new capital was built, Ville de Fort Royal. After the 1763 Treaty of Paris, the island was ceded to Great Britain who named it Saint George’s Town, after the patron saint of England. It remained ever since British until its independence on 7th of February 1974. The Queen of England is still the Head of State as Grenada is a member of the Commonwealth Nations. One more island, and another country before a last one in this trip. 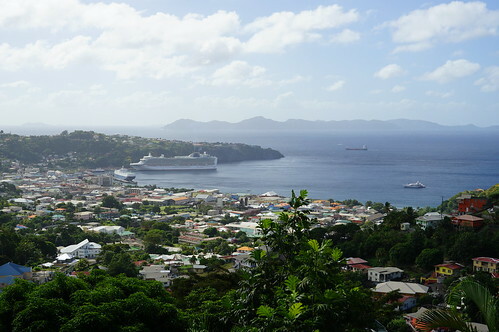 Moving on from Antigua onto the exotic Saint Lucia, docking at its capital city Castries. The only country in the world named after a woman; pulled back and forth for 14 times between the French who were the first to settle in the island and the British; it became permanently a British Oversee Territory until 1979 when it gained full independence. The Queen of English however, is still the head of the state as Saint Lucia is part of the Commonwealth Nations. Among its key sights in such a small land, nature and landscapes are somehow unique. The incredible rain forests, such exuberant vegetation and truly paradise beaches all around, but something unique adding to the excitement, it is one of the few islands in the world that contains a drive-in volcano. 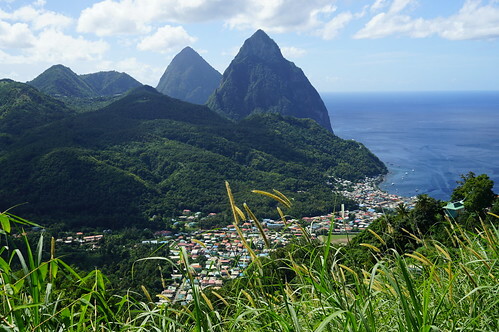 This is self-described by the word, you can be driven right there to the very edge of the boiling water springs, but do not expect any height, instead a rather hilly area at the backdrop of Soufriere with marvellous views towards the colonial city, the coast and the world famous Pitons Mountains. After such a little piece of paradise that was Tortola, although anywhere in this trip and all the islands we are visiting are pieces or paradise, we dock in the capital city of a new country in the list of countries visited so far to date, Antigua and Barbuda. That’s 97 as of today, exactly the half of the world’s currently independent nations (it’s 195), and still 2 new ones to come in the next few days to rise to an astonishing 99. The country name was, likewise almost all other islands in the region, given by Christopher Columbus in 1493 in his second voyage in honor of the Virgin of La Antigua in the Seville Cathedral. It was nevertheless not a priority island to form a settlement, and has been for majority of the history part of the British Empire and Kingdom, until gaining sovereignty on the 1st of November 1981. Since that date, it remains a member of the Commonwealth, where Queen Elizabeth II is the head of state. After the tipping point back at Puerto Plata in Dominican Republic, now heading back towards the port of arrival at Bridgetown in Barbados, stopping at the remaining islands we did not pass by when heading north. This is the turn of the capital city of the British Virgin Islands, Road Town in the principal and largest island, Tortola. As exotic as it sound just by the name, we were not wrong. It’s sometimes incredible to see such exotic and exuberant nature and paradise beaches in so little piece of land. Yet again another place first sighted by Christopher Columbus in his second voyage in 1493 who named the archipelago Santa Ursula y las Once Mil Vírgenes (Saint Ursula and her 11000 Virgins), shortened to Las Vírgenes (The Virgins) after the legend of 5th century Christian martyr Saint Ursula. 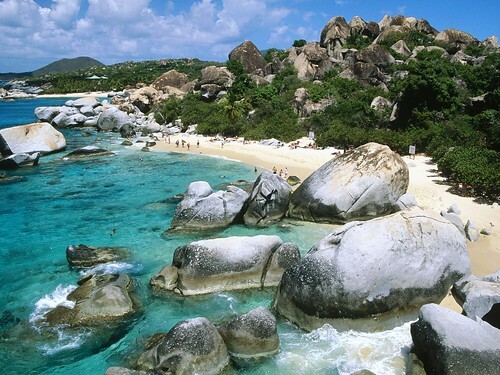 The name of Tortola comes itself from the Spanish for the bird turtledove. Nevertheless there was never a Spanish settlement here, but Dutch first then British, who they do still belong to the Kingdom. So in this case, like it was back at Sint Maarten, we are not visiting a new country as such, but an overseas territory. Being dropped off at Road Town is nice spot because you can reach anywhere else in the island of Tortola at easy convenience, and because of the very reduced size and short distances, you can potentially visit the entire island in the time you are given since arrival until departure of your cruise, which is generally from the early morning until 18.00pm. Well enough for either reaching the north coast and enjoy what this island is more famous, the white sandy beaches;having a great snorkelling time in the crystalline waters or taking the speed boat towards Virgen Gorda Island in order to admire one of the greatest beaches on earth, The Baths. Continuing the cruise after some Dutch feeling at Sint Maarten, and after an entire day and night cruise this time only resting and enjoying the plenty of activities to do on-board, we dock at Amber Cove, the port of Puerto Plata in Dominican Republic. A city of many firsts in the Americas. It was here nearby that the very first village in the “New World” was founded on January the 2nd, 1494 called La Isabela, in honor of the Queen of the Spanish Empire. Dominican Republic was named back then, La Hispaniola, the first piece of land where Christopher Columbus set foot in 1492. Puerto Plata is the 9th largest city in the country, therefore do not expect a city or large distances or lots to see and do. All the opposite, there’s not really that much here other that of course, the incredible landscapes and nature at the backdrop, and the impressive paradise beaches just east of the city. The top resorts are not far east as you can imagine. it is for this reason it’s a booming tourist destination, made even more accessible after the recently opened new cruise terminal at Amber Cove. Fair enough this is not Punta Cana, but it’s a great alternative for the beaches; and so it’s not Santo Domingo, but a nice idea for a first time in the country. Another day passing, and onto another island in this cruise through the Eastern Caribbean islands right after the previous base at Saint Kitts and Nevis. This time onto the smallest of the islands we would visit in the trip, and even considering such a small piece of land, yet divided in two, the French and the Dutch sides. The Dutch in this case, the part we would visit, which is nevertheless, the one that houses the main international airport and the cruise terminal. Discovered in 1493 on the second voyage of Christopher Columbus, and named as such as it was Saint Martin’s day when was first sighted, 11th of November. While claimed to the Crown of Spain as a territory, it was never settled and was a low priority. Instead the Dutch and the French saw it as a key location among their other territories in the Caribbean and North America who made it very profitable mining salt, moment in which the Spanish saw again an interest and captured it from the Dutch for 15 years, losing again interest and completely abandoning it in 1648. A new day, and with it, a new port of call after Saint Vincent two days before. This is the turn for another country, Saint Kitts and Nevis, docking at its capital city Basseterre. This is now making the already serious number of country 95 visited so far up to date. Yet again, the count can easily go up here in the Caribbean especially if on a cruise. The only real way for enjoying the islands to be honest at a decent overall cost than if going on your own planning yourself the trip. Inter islands flights are quite expensive not to mention the hotels. Yes I agree is nice to stay longer at some of these pieces of paradise, but for now, getting an idea of the region seeing the most we can is the best option. Basseterre, meaning low land as it’s located in the lowest height in a rather flat area of the island was founded in 1627 by the French. Then made the capital of the island of Saint Kitts in 1727 following the French expulsion full British control, and remained ever since the capital of the country counting the second island of Nevis as part of its territory after its political independence on 19th of September 1983. Although small, it has lots to offer, especially that is completely surrounded by lush green hills and mountains, hence beautiful scenery and nature. It’s also home to spectacular Georgian manor houses once home to wealthy sugar plantation owners. It was the main economy back in the colonial days, production of sugar, like in all of the other former colonial islands. 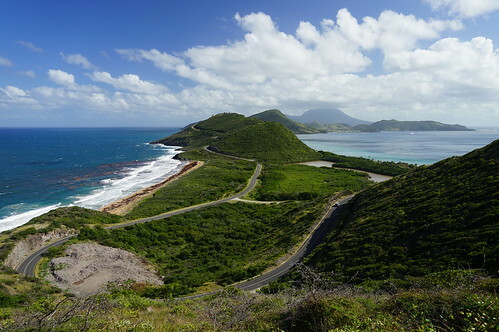 The remains of factories are scattered in both St Kitts and Nevis islands, while manors and houses have been turned into museums and luxurious hotels. 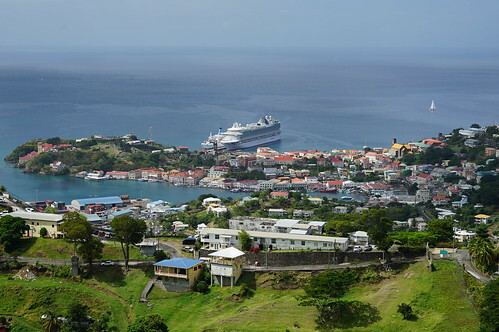 Next port of call in this cruise after Barbados, docking at Kingstown, the capital city of small Saint Vincent and the Grenadines, country formed of the main Saint Vincent island and 32 other smaller ones. 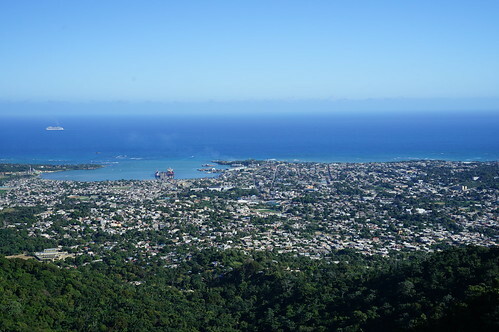 Now if Bridgetown was small, here Kingstown is a much smaller fraction in size, with little to almost nothing really worthy from a touristy point of view, yet like almost every island in the Caribbean, lots of beautiful nature, although not many beaches as it is in the other islands. Founded by the French in 1722, it turned hands from the French to the British, back to French and lastly to the British again before gaining independence on 27th of October 1969, however still remaining in the Commonwealth, a constitutional monarchy and representative democracy where Queen Elizabeth II is the Head of State. 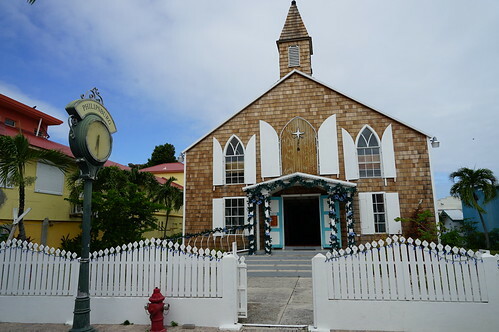 The mix between the French and British colonial past is seen everywhere and not just in the capital city, but across the islands with its architecture and heritage. Tiny yet very cute, the island of Saint Vincent is in fact full of extreme natural beauty and lush vegetation, all due to La Soufriere Volcano located in the northern side. However, the few hours in between since the early morning arrival until the evening departure of the cruise was well more than enough, as there’s not much more you can do here. And if you would think about going to some nice paradise beaches, then it would be better to wait for another port of call in your cruise since Saint Vincent is not really the place you would consider the perfect paradise in the Caribbean. 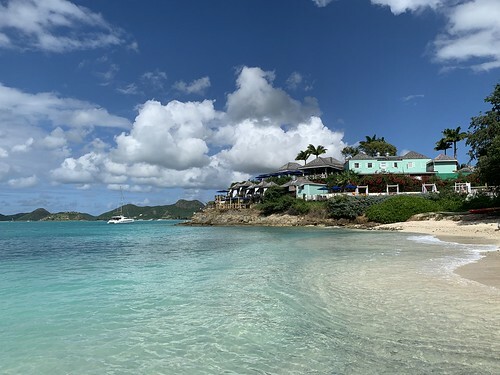 It’s quite rough because of the nature, although in the Grenadines archipelago you will for sure find such paradise and the turquoise waters as is in Mustique, Canouan or Carriacou islands.